Since UTC agreed to chair our 2013 campaign, it only made sense to ask them to jump-start our workplace giving program and kick-off a company wide initiative starting March 1st. UTC took that idea and really ran with it. 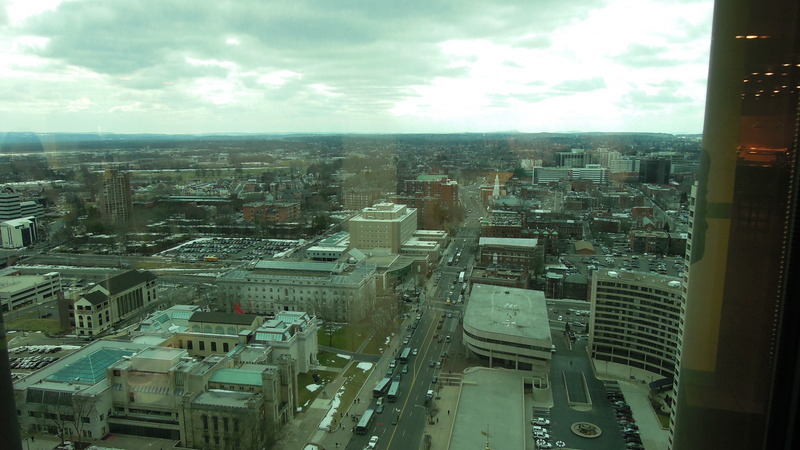 View of Hartford from the Gold Building cafeteria. For the entire month of March, UTC will host workplace giving campaigns in each of their business units: Otis, Pratt & Whitney, Sikorsky, United Technologies Aerospace System, United Technologies Research Center, UTC Climate, Controls & Security and corporate headquarters in the Gold Building. Coordinators from each of the business units, working with Sandy Broadus (Assistant General Counsel, Litigation) under the leadership of co-chairs Matthew Bromberg (VP of Coporate Strategy & Development) and Charles Gill (General Counsel), are planning dozens of interactive and hands-on arts events to get employees engaged with our tremendous arts community. What an undertaking! My colleague Laura McLelland, the Arts Council’s director of workplace partnerships, is coordinating each company’s giving campaign and helping Sandy and her team come up with fun, creative ideas to motivate employee support. 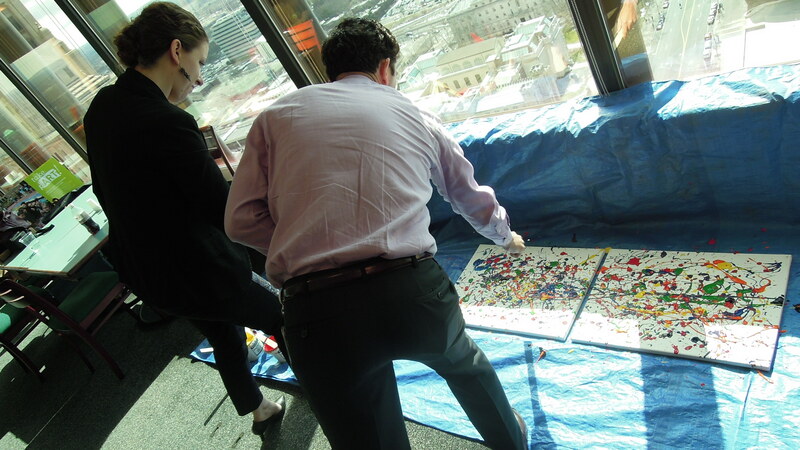 Together, they agreed that the campaign should kick-off on March 1st at corporate HQ with a fun, easy way for people to create a one-of-a-kind piece of community art; Laura had the perfect solution: a Jackson Pollock-style drip and splat painting activity. Oh the Drip & Splat (I’m trying to change the name to DYOP, hence the title of this article). It’s been a longtime staple of our workplace giving program—probably because it’s so popular. And fun. And easy. Laura leads the Drip & Splat activity. Last Friday, I went over to the Gold Building with Laura and Meaghan Wooldridge, our Workplace Giving Associate, to run a Drip & Splat (DYOP) with the folks at corporate HQ. The activity was a resounding success—after the first few employees, including the cafeteria staff, left their marks, employees were lining up to try their hand at abstract art and claim their very own ‘I take pART’ sticker. Sandy proved to be amazingly adept at recruiting volunteers, and by the end of the activity more than 100 UTC employees had taken pART. Yesterday, Arts Council staff were down at Pratt & Whitney’s location in Middletown running a similar DYOP activity; as I write this article, Laura and Meaghan are journeying down to the southern part of the state to Sikorsky to create two more pieces of DYOP art. And this is just the beginning! Stay tuned for more updates and other UTC workplace events as March unfolds. Interested in running a DYOP activity at your workplace? Talk to Laura.